Have you ever touched the Yamuna? Have you ever entered the Ridge? Are you aware that not only are these two landscape features the life-lines of Delhi, they also provide critical ecosystem services to each one of us without which life would not be the same in the city. If you are, we invite you to come on board the urban ecotourism bus tour this Earth Day, to do a status check of the lifelines of Delhi. If you aren’t, hop on still and get introduced to the natural heritage around you. This Earth Day 2011, all of us must take out time to say a BIG THANK YOU to Mother Earth and all that it provides without asking for anything in return. The ‘Earth Day’ urban ecotour will be an attempt to explore the political ecology of Delhi, and bring the citizens closer to the two lifelines of the city: River Yamuna and the Delhi Ridge! Delhi Greens, in partnership with Jamghat – a group of street children and with support from the Earth Day International, invites all those who have ever been fascinated by Delhi, or are interested in urban environments and even those who are simply amazed by cities! This Earth Day 2011, come participate in the urban eco-tour! Its time to think global and act local! 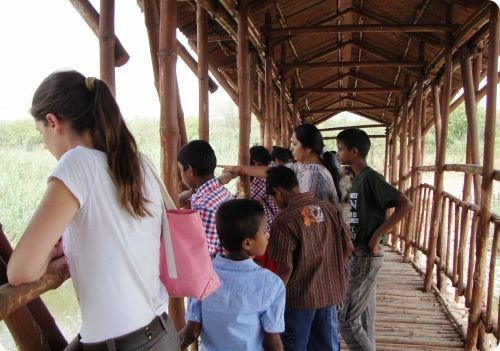 Urban Ecotourism is a unique concept put forward by Delhi Greens for the city of Delhi with an objective of creating more effective and better informed citizens and highlighting the role and importance of green spaces and natural landscape in maintaining the environmental health of the city. There is no charge for joining the Earth Day 2011 urban ecotour and participation is free of cost. Registration confirmation will be on a first-come-first-serve basis. So hurry and get yourself registered for the Urban Ecotour and contribute your bit for making a healthier Planet, this Earth Day 2011. 2008:This Earth Day 2008: Don’t Just Recycle, Freecycle (Network) It! Saluting the Earth on Her Day! Heroes of IEEE Appreciated on Earth Day!